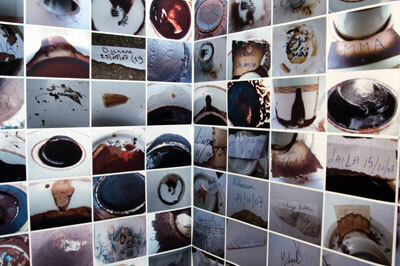 Lara Baladi’s Surface of Time: Diary of the Future (2007 – 08), an installation commissioned especially for the exhibition, is a large-scale, ceiling to floor composition of photographic panels, with each panel comprising an image of the traces and residues left inside Arabic coffee cups. After each cup of coffee has been drunk, then upturned and left to settle, the patterns of sticky coffee remains are read by a guest to describe the imbiber’s destiny. The reading of the shapes of leftover coffee on coffee cups remains a fortune-telling practice in many contemporary cities, villages and homes across the Middle East. For this installation, the images and accompanying sounds were collected by Baladi over the course of her father’s illness when friends and family paid them daily visits. During this very delicate period, she engaged in a complex personal quest of metaphorically and metonymically looking for answers about death, mediation, communication, popular beliefs and the ephemeral nature of time. Each image offers a subjective reading of the imbiber’s destiny, while the whole tableau tries to capture the language and spirit of the black coffee ritual. Another series of images develops further the daily condolence visits paid to Baladi’s family, linking, if only for a moment, each visitor’s destiny to her father’s, creating a sort of collective mythology. Baladi suggests that despite efforts to carve a unique path for ourselves, we are bound by a common language that speaks to our fleeting place within the enduring repetition of time, of the movement found within stillness. The future, which is dependent on the present, is redefined every day, perpetually producing different destinies and ultimately makes us vividly aware of the future’s uncertainty. 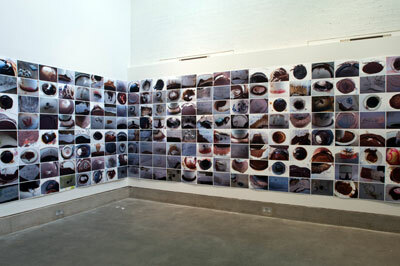 Lara Baladi’s work shown at The Open Eye Gallery features large photographic diptychs from her series Surface of Time (2004-07). This work questions the past, observes the present and projects itself into the future through her capturing of everyday objects that have been forgotten and weathered by the passage of time: “Through their physical relationship to time, these objects achieve a life of their own in Baladi’s photography, their derelict state alluding to a rusting image of President Mubarak and the inertia of the Egyptian political and economic situation”, (Lara Baladi, Surface of Time, B21 Gallery, 2008, p.6). Lara Baladi was born in Lebanon in 1969 and is of Lebanese-Egyptian origin. She is an artist working essentially through a process of accumulating, interpreting and re- interpreting images – a broken fragmented memory, which “she tries to fix” in various media and forms such as installations, videos, collages, and tapestries. 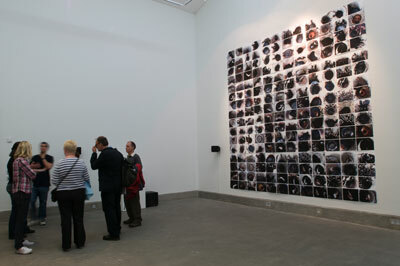 Her work has been exhibited internationally across the Middle East, the US, Japan and Europe, and is part of a number of contemporary art collections, including the Fondation Cartier in Paris, the Museet for Fotokunst in Copenhagen, the Pori Art Museum in Finland and the Chase Collection in New York. 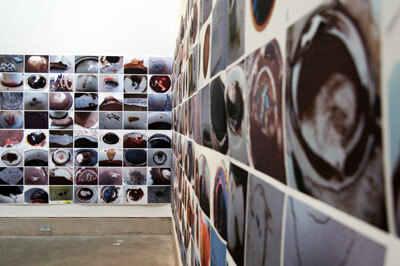 Following a fellowship she received from the Japan Foundation in 2003, she exhibited one of her large-scale installations, ‘Roba Vecchia’, in Cairo in February 2006, in Art Dubai at the Sharjah Biennial in 2007 and in the Kennedy Centre in Washington DC, in February 2009. 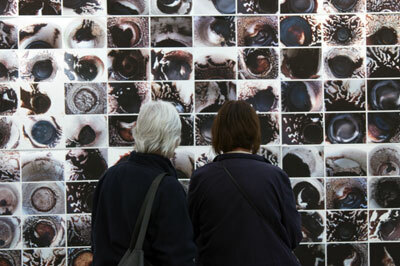 In 2006, Baladi was commissioned to show a 20-screens/projections installation along one kilometre of seashore on the opening night of the Image of the Middle East Festival in Denmark. She won the Grand Nile Prize at the 2008/09 Cairo Biennial for her ephemeral construction and sound installation Borg El Amal.